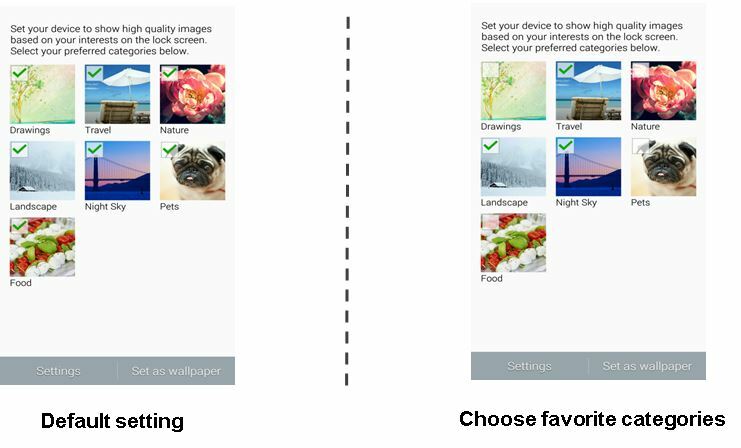 Galaxy Note4: How many categories can users select? Galaxy Note 4 - How many categories can users select? There are 7 categories in Galaxy Note 4, Galaxy Note Edge .Users can select 7 categories at maximum if he/she wants to see various kinds of wallpapers. One category should be chosen at least when user want to use the ‘My Interest’ continuously. Android™ 5.0, Lollipop: How do I change the lock screen notifications on my Samsung Galaxy Note® 4? Galaxy A5 (2017) - What can I do if I forget my screen lock password, PIN or pattern (SM-A520W)?